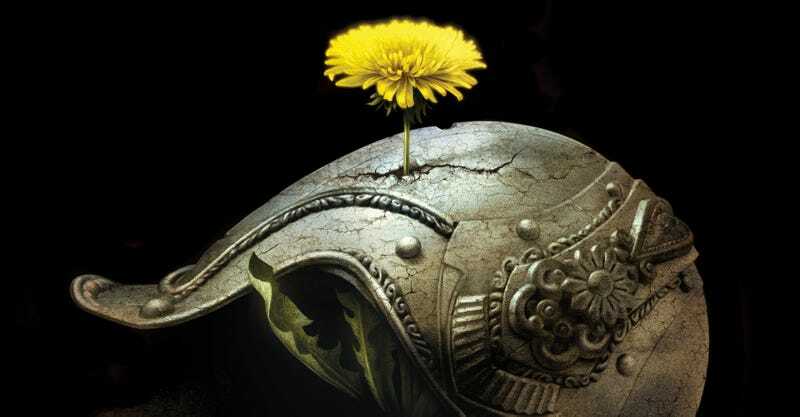 Ken Liu is one of the most award-winning and acclaimed writers of the past few years. And today sees the publication of his first novel, The Grace of Kings, which is already getting rave reviews. We'll have a review later this week, but first here's an an exclusive excerpt. Écofi Island: the Tenth Month in the Twenty-third Year of the Reign of One Bright Heaven. Emperor Mapidéré had not looked into a mirror for weeks now. The last time he had dared to look, a pallid, leathery mask had stared back at him. Gone was the handsome, arrogant, fearless man who had made ten thousand wives into widows and forged the crowns of the Seven States into one. His body had been usurped by an old man, consumed by fear of death. He was on Écofi Island, where the land was flat and the sea of grass stretched as far as the eye could see. Perched atop the Throne Pagoda, the emperor gazed at the distant herd of elephants strolling majestically across his field of view. Écofi was one of his favorite spots to pass through on his tours of the Islands. Miles and miles away from the busy cities and the intrigue of the palace in Pan, the emperor imagined that he was alone and free. But he could not deny the pain in his stomach, the pain that now made it impossible for him to descend the Throne Pagoda on his own. He would have to call for help. The emperor hesitated, but relented. He sipped the bitter bever- age, and it did seem to numb the pain slightly. Like all men who spent their lives in conquest, he had long turned his thoughts to the ultimate foe. For years, Pan had been filled with alchemists working on elixirs of eternal life and youth. Swindlers and con men had flooded the new capital and drained the treasury with their elaborate laboratories and research proposals that never seemed to produce anything useful; the clever ones always packed up and could not be found when it came time for an audit. He had swallowed their pills, pills distilled from the essences of a thousand species of fish, some so rare that they were found in only a single lake in the mountains, pills prepared in the holy fire of Mount Fithowéo, pills that were supposed to protect him from a hundred diseases and make his body immune to the passage of time. They had all lied. Here he was, his body ravaged by a disease that all the doctors gave different names to but were equally powerless against, a twisting, recurring pain in his stomach like a coiled snake that made him unable to eat. For centuries, back before the Xana Conquest, back when young Mapidéré was still called Réon, his hair still full and lush and his face unlined, the Seven States had vied for dominance of the Islands of Dara: rustic and arid Xana in the far northwest, confined to the islands of Rui and Dasu; elegant and arrogant Amu, fortified in rain- drenched and balmy Arulugi and the fertile fields of Géfica, the land between the rivers; the Three Brother States of woodsy Rima, sandy Haan, and craggy Faça, nestled in the northern half of the Big Island; wealthy and sophisticated Gan in the east, filled with big cities and busy trading ports; and finally, martial Cocru on the southern plains, famed for her brave warriors and wise generals. Their web of shifting alliances and enmities was as confusing as it was dynamic. In the morning the King of Xana and the King of Gan might still call each other brothers, and by that night Gan’s ships might already be sailing around the Big Island for a sneak attack, aided by fast cavalry from the King of Faça, who just that morning had sworn that he would never forgive Gan for past treacheries. And then came Réon, and everything changed. He was in Pan, the Immaculate City, standing in the middle of the broad expanse of Kiji Square in front of the palace. Normally the square was empty, save for children who flew kites in spring and summer and built ice statues in winter. Occasionally an Imperial airship landed in it, and nearby citizens would gather to watch. But today the square was not empty. He was surrounded by colossal statues of the gods of Dara. The statues, each as tall as the Throne Pagoda, were made with bronze and iron and painted with bright, lifelike colors. Long ago, Thasoluo, the World Father, was called away by the King of All Deities, Moäno, never to return. He left behind his pregnant wife, Daraméa, the Source-of-All-Waters. Alone in the void, she cried hot, large tears of lava as she gave birth. The sizzling tears fell from the heavens into the sea and solidified into the Islands of Dara. Eight children were born. As the gods of Dara, they staked out their claims to the Islands and watched over the native inhabitants. Daraméa, comforted, withdrew to the great ocean, leaving her chil- dren in charge of Dara. Later, when the Ano arrived and spread throughout the Islands, their fates also became inextricably bound with the doings and undoings of the deities. The emperor had long dreamed of confiscating all the weapons of Dara, all the swords and spears, all the knives and arrows, and melting them down into their constituent metals so that they could be turned into statues honoring the gods. Without weapons, there would be eternal peace in the world. He had always been too busy to convert his grand vision into reality, yet somehow here they were. Perhaps this was a chance for him to plead his case directly to the gods, to ask for long life and good health and restored youth. Mapidéré knelt first before Kiji, the source of Xana’s strength. The statue depicted a middle-aged man with white sideburns, a bald head, and a white cape on his back. Mapidéré admired the intricate designs on the cape, showing Kiji’s mastery over wind, flight, and birds. On Kiji’s shoulder sat his pawi, the Mingén falcon. The emperor wished that the god would give him a sign that his prayer was heard. But he well knew that the gods preferred to work in obscure mystery. Next to Kiji were the Twins, Kana and Rapa, patrons of Cocru. Kana wore a black dress and had brown skin, long silky black hair, and dark-brown eyes, while Rapa, with a face identical to her sister’s, wore a white dress and had pale skin, snow-white hair, and light-gray eyes. Over the sisters’ shoulders stood their pawi, a pair of ravens, one black, one white. The statues of the goddesses shifted and came to life. The emperor was too stunned to move or speak. Kana turned her bronze eyes to the kneeling Mapidéré like a woman turning to gaze at an ant. Her voice was loud, harsh, discor- dant, recalling the scraping of rusty swords across an old sharpening stone. Mapidéré looked back and saw that the thunderous, sonorous voice belonged to Kiji, who had also come to life. The statue took a step forward and the ground quaked beneath Mapidéré. The Mingén falcon took off from his shoulder and circled over the statues of the gods; Kana and Rapa’s ravens took off also and cried challengingly at the falcon. “Have you forgotten our pact?” said Rapa, whose voice was melli- fluous, cool, harmonious, but no less powerful than her sister’s. She and Kana were as far apart as ice and fire, yet as close as sleep and death. “I’m not the one agitating for further bloodshed,” said Kiji. He lifted his left hand, which was missing a pinkie, placed the index and middle fingers into his mouth, and whistled. The Mingén falcon, still gazing balefully at the ravens, reluctantly returned to his shoulder. Mapidéré despaired at the words of Lord Fithowéo, the god of the hunt, of metals and stone, and war and peace. The emperor looked into the god’s eyes, the cold, dark obsidian from Mount Fithowéo, and saw no compassion. His pawi, the wolf, howled to accompany the end of his master’s rumbling speech. Fithowéo bared his teeth at Kiji and let out a bloodcurdling war cry. “—or make you lose more than just your pinkie from frostbite,” said Rapa. Her lovely, cold voice made the threat seem even more frightening. Mapidéré fell to the ground and scrambled away on his hands and knees to the statue of Rufizo of Faça, lord of life, healing, and green pastures. He grabbed a big toe with both his arms, but the cold metal provided no comfort. Rufizo was a tall, lanky young man wearing a cape of green ivy. His sad eyes came to life, and he shook his foot carefully, casting off Mapidéré like a dirt clod. He stepped between Kiji, Fithowéo, and the Twins and spoke in a voice as gentle and soothing as the pools fed by Rufizo Falls, whose water was hot year round, keeping nearby pastures green despite the cold climate of the Faça Highlands. Mapidéré, lying on the ground, was comforted by this speech. He remembered that in the aftermath of the mythical, bloody Diaspora Wars, when the gods had accompanied ancient Ano heroes onto the battlefield, the divine siblings had vowed to never again take up arms against one another. Henceforth they would only interfere in the affairs of men indirectly, by persuasion, trickery, inspiration, or prophesy. The gods also agreed to never again directly fight against the mortals, but to work through other men. “You have spilled too much blood.” Rufizo sighed, and his pawi, the white dove, cooed. “I spilled blood to prevent the spilling of more blood,” Mapidéré insisted. Laughter, as wild as a tornado, as chaotic as a whirlpool, rose behind the emperor. It was Tazu, the shape-shifting god of Gan. He was a lithe figure in a fish-skin tunic decorated with a belt made of shark’s teeth. The swirling pool at Tazu’s feet grew, and Mapidéré scrambled to back up out of its way. Although the gods had promised to not actively aim their wrath at mortals, the great Ano lawgiver Aruano had noted that the promise, like all the laws that bound men and gods, left room for interpretation. The gods were charged by their mother, Daraméa, the Source-of-All-Waters, with the running of the natural world: Kiji governed the winds and storms; Rapa guided the flow of glaciers across eons; Kana controlled the flashy eruptions of volcanoes; and so on. If mortals happened to be in the way of these forces of nature, like Tazu’s famous whirlpool and raging tides, then their deaths would not be a violation. Mapidéré had no interest in testing how Tazu, the most unpredictable of the gods, interpreted his own promise. Tazu laughed even louder, and the great shark sank back into the pool at his feet. But the pool of water stopped spreading as the ground beneath Mapidéré turned into quicksand as black as the famed sands at Lutho Beach. Mapidéré sank up to his neck, and he found that he could not breathe. Mapidéré struggled to breathe. Lutho’s words made no sense to him, but that was to be expected of the lord of tricks, mathematics, and divination, whose domain was beyond the understanding of mortals. Mapidéré, now forgotten, felt his old heart clench. So it’s to be war again? Has my life’s project been in vain? Lutho smiled and said nothing. Tututika, the ethereal goddess of Amu, spoke last in a voice as calm and pleasant as the flat, tranquil surface of Lake Tututika. The speech of the golden-haired, azure-eyed goddess with skin the hue of polished walnut silenced the other gods. “You can’t escape the weight of history,” said Kiji. “A lesson that mortals have learned again and again—”said Rapa. “But it doesn't seem to take,”finished Kana. The goddess glided toward Mapidéré, her blue silk gown spreading open like the calm sky. Her pawi, a golden carp whose sparkling scales dazzled the emperor, swam through the air like a living airship.